Posted by Unknown | 9:18 AM | Tanzania Cultural Tourism, Tanzania Facts., Tanzania festivals, Tanzania Holidays. My first ever festival was my birth day, and am glad to say that today is my birth day. It is commonly known that when a child is born comes the celebration. Well I like festivals and I hope you do too. I won’t talk about my birth day but about Tanzania annul festivals in depth and in details. Many writers don’t have good details on Tanzania festivals like the way I do, (am bragging about it!). I have read most articles on festivals that talk about public holidays mostly. But they don’t know how these holidays are brought into life by Tanzanians; they simply assume the similarities with other countries. Take an example of Christmas. I know it’s only May and we have long way to go for Christmas, but just read this to prepare yourself for the holiday. First of all it doesn’t snow here in Tanzania so please don’t compare it with the U.S. or any other country. If you want the snowing you ought to hike Mount Kilimanjaro. But one thing in common is the family gathering tradition. I am Chagga ( a tribe from Kilimanjaro region) by native and it’s a tradition to go back home in Kilimanjaro for this holiday. At this time of the year most things becomes untouchable like an Indian dalit though the reason behind is the price tag, but people will still buy. I guess Nakumat Super Market had this in mind that’s why they have a branch in Moshi Town. The buzz, feasting and the fun are the most quality things you can’t ignore during Christmas in Tanzania. 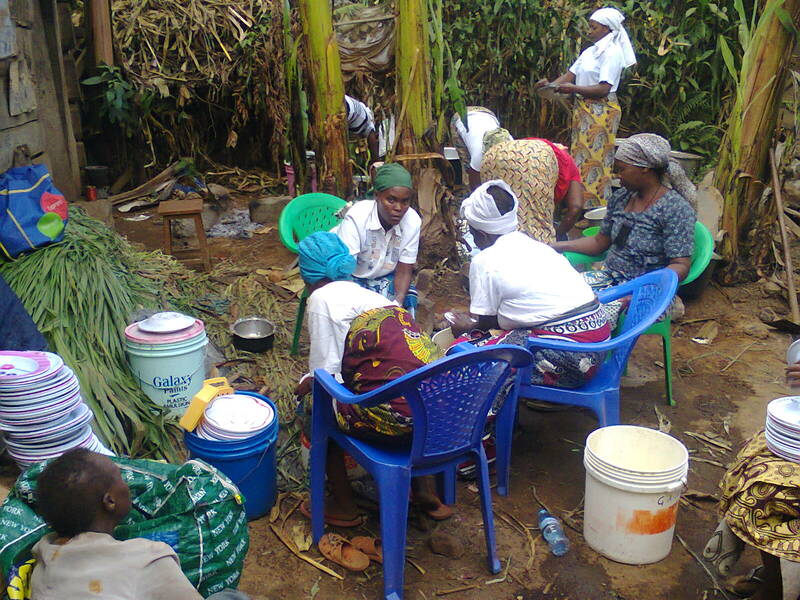 Chagga women in cleaning after feasting. Ramadan and the Eid-al-fitr is a Muslim prolonged festival like no other. The one thing I like the most about this ceremony is the fasting and the reward of iftar in swahili FUTARI (a meal especially prepared after the long 12 hours fasting) after the fast. If you can be as lucky as me you get invited to have a futari. Who can deny the taste of heavy juicy coconut milk, spices and everything nice as compliments to healthy ingredients in the making of futari? I bet, you won’t want to miss the next invitation. The setting and arrangements of the futari is done on a well knitted mart, could be locally made or bought from somewhere else. Next thing is folding your legs and share the delicious futari. Another thing noticeable is the full use of khangas (original made In Tanzania piece of cloth) and hijabu(Muslim way of dressing) very conservative. Other Muslim festivals include Eid-al-hajj (festival of sacrifice) Islamic New year and Prophet Mohammad's birth day. Most of times it's published that during Ramadan it is consider offensives eating in public but I'm real not sure about that, since Christians are all over. This applies effectively in Zanzibar. Political public holidays like Union day and Independent day have their own tastes and are very appealing. Despite the commemoration of these important days we get to enjoy Gwaride (parade) from different security and defense forces divisions like the Police and the Army. Here you enjoy the quality performance from the parading activities like marching. Most of these holidays are conducted at the national stadium most of times in Dar es salaam. I like traditional dances that are performed on these days and the reminder of the national song and anthem. Stay tuned for part two. Stories to be covered includes the most popular and well know festivals by international tourist in Tanzania which most of them happen in Zanzibar. And the reasons behind their popularity.